South Bay San Diego, located south of downtown San Diego and north of the US/Mexico border, is a cross-border hotspot for the most authentic Mexican and Baja-Med cuisines. TV personalities Andrew Zimmerman and Anthony Bourdain have already lauded the San Diego/Tijuana region’s culinary excellence, and South Bay provides the perfect opportunity for those looking to try the best of the Baja-Med craze without the need of a passport or border waits. Check below for some of the local favorites. Tapas at Romesco Baja-Med Bistro. Photos courtesy of www.romescomexmed.com. Javier Placincia, widely known as one of the best Baja-style chefs, has helped put the San Diego/Tijuana region on the culinary map. Anthony Bourdain visited his famous Tijuana restaurant, Mision 19, to experience the Baja-Med craze first hand. The Baja-Med movement uses fresh, local, Mexican ingredients with Mediterranean cooking techniques and ample room for creative, cultural blending. Lucky for us, Placencia serves his famous Baja-Med cuisine stateside at Romesco Baja-Med Bistro. The bistro serves a wide variety of traditional Mexican dishes as well as Spanish Tapas, Italian pastas and a wine list that highlights the best of the Mediterranean, California, and Baja’s famous Guadalupe Valley. Barbacoa de Borrego at Aqui Es Texcoco. Photo courtesy of Yelper Mikey P.
Similar to Romesco Baja-Med Bistro, Aqui Es Texcoco started serving its famous Barbacoa de Borrego (slow-roasted lamb) in Tijuana in 1990. Since opening its second location in Chula Vista, visitors to San Diego don’t need to cross the border to experience the most succulent and authentic barbacoa-style lamb and homemade sides. Savory Empanada at Maye’s Desserts & Bistro. 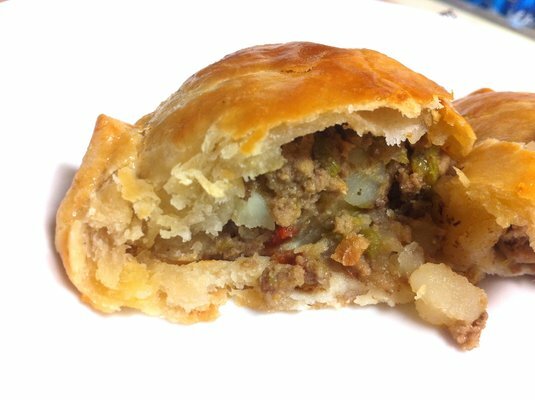 Photo courtesy of Yelper Misty W.
Empanadas, in every flavor you could possibly imagine. That’s what is served at Maye’s Dessert & Bistro. It’s a great idea to start with a few savory selections, such as Papas con Rajas (potatos, green chile and cheese), Hawaiian Rib and mouthwatering Pollo Chile Verde, but make sure to leave room. True to its name, the dessert empanadas are the real stars of Maye’s. Chocolate Éclair, Nutella, and Banana Cream are just some of the sugary offerings wrapped in perfectly fresh, hot and flakey pastry dough. This is just the beginning of a great culinary adventure in South Bay San Diego. What are your favorite places to dine on authentic Mexican and Baja cuisine in South Bay?